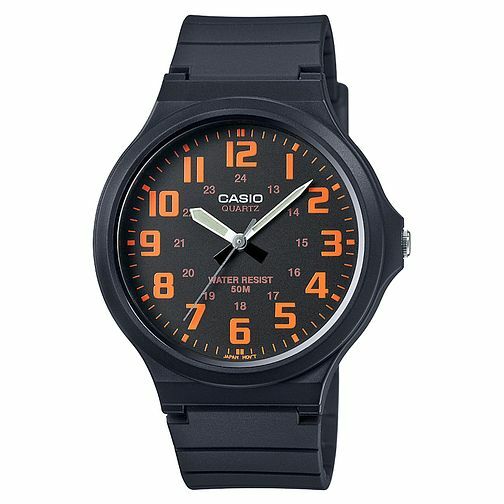 Stylish and functional for everyday wear, this great value timepiece by Casio is styled with a comfortable black resin strap and easy to read black and orange arabic dial. It's also water resistant to 50 metres. Casio Men's Black & Orange Dial Black Resin Strap Watch is rated 5.0 out of 5 by 1. Rated 5 out of 5 by Anonymous from It was great thing to buy as gift for my son. He loved it. Sometimes it is good to buy a gift from a gift shop H.Samuel is great place to buy. Their products are quality.